Garden Park at Daybreak is a luxurious 55+ community located in South Jordan, Utah, conveniently close to Salt Lake City. The community is part of the larger master-planned Daybreak community, providing residents with access to a number of amenities and activities within Daybreak. Homes are available on a new and resale basis, and when complete, this active adult community will include 500 residences. Residents at Garden Park at Daybreak can enjoy modernized facilities, amenities to stay active, and a number of outings and activities planned by the community. The scenic beauty and seasonal climate of Central Utah also adds to this community's endless appeal. Garden Park at Daybreak offers a 10,000 square-foot clubhouse, which is the perfect place for neighbors and friends to gather and socialize. Within the clubhouse is a fitness center, allowing residents to stay active and in shape without leaving the grounds or paying for an expensive gym membership. Homeowners can take fitness classes in the aerobics and dance studios, or have a solitary workout on the many cardio machines. Beyond that, the clubhouse is also home to a multi-purpose room, billiards area, and demonstration kitchen, and a ballroom for parties, all giving the active adults of Garden Park at Daybreak plenty to do. The outdoor amenities at Garden Park at Daybreak are plentiful. Homeowners can take a dip in the outdoor pool, or simply relax with neighbors on the patio. Athletes can challenge one another to a game on the tennis courts, or green thumbs can see what's growing in the community gardens. In addition, there are a variety of parks and trails available throughout the area, where residents can take time to appreciate the great outdoors. Construction of Garden Park at Daybreak began in 2010 and, when complete, will feature 500 homes in various designs. Garden Park at Daybreak includes expertly constructed single-family, attached and condominium homes in five different collections. The condo units range in size from 696 to 1,791 square feet, and feature one to three bedrooms, one to two bathrooms, and an attached two-car garage. The townhomes are offered in three floor plan options, ranging in size from 1,197 to 1,601 square feet. These attached homes offer one or two bedrooms, one-and-a-half to two-and-a-half bathrooms, and two-car attached garages. They also feature outdoor spaces like covered porches and patios, depending on the model. The slightly larger patio homes vary in size from 1,219 to 1,427 square feet, offering three different floor plan options. All patio homes feature two to three bedrooms, two to two-and-a-half bathrooms, and an attached two-car garage. Homeowners enjoy the outdoor space and walk-in closets these plans have to offer. The garden homes also offer three distinct floor plans from 1,433 to 1,517 square feet in size. These plans give homeowners the option to choose between one and two bedrooms, and all garden homes offer two bathrooms as well as a two-car attached garage. The estate homes are the largest in Garden Park at Daybreak, including five floor plans that range in size from 1,934 up to 3,328 square feet. Featuring two to four bedrooms, two or three baths, and an attached two-car garage, these homes offer a variety of customization options to fit any taste and budget. Additionally, these homes all benefit from the homeowners' association fee, which covers yardwork and exterior maintenance. Residents of Garden Park at Daybreak will never have to worry about boredom with the many activities and outings available. Along with the events in the Garden Park neighborhood, homeowners here also have access to activities at the master-planned Daybreak community. From meeting neighbors at the 4th of July block party to enjoying fall or winter festivals, there's something to do year round in this community. A number of clubs and events take place at Garden Park at Daybreak on a regular basis, including community yard sales, day trips, farmer's markets and live music. Culinary enthusiasts can take part in a local chili cook off, and car buffs can check out the classic car show. There is truly something for every interest at this very active 55+ community. Garden Park at Daybreak is conveniently located just outside of Salt Lake City, one of the state's most popular areas. The community itself is near local restaurants, parks, and an equestrian center. For travel, residents of Garden Park at Daybreak can hop on nearby Highways 154 or 175. The community is only an eight-minute drive to Riverton Hospital, making access to healthcare a breeze, and it's only about 15 minutes away from a grocery store. 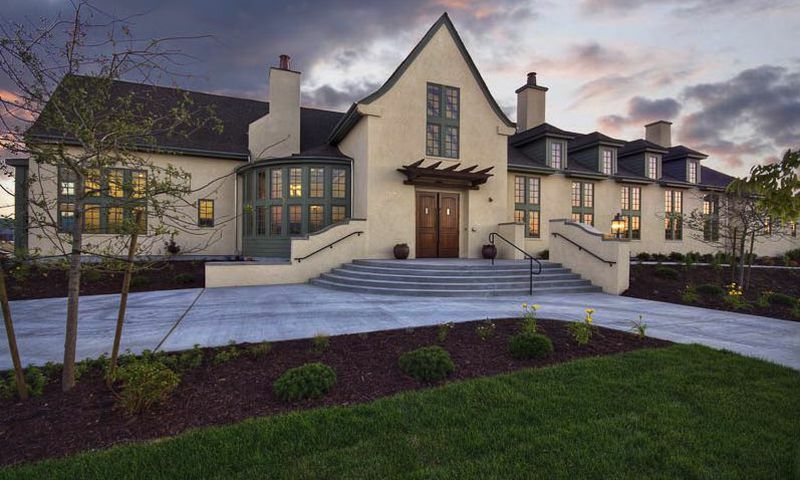 For farther travel, homeowners here are only about 20 miles away from Salt Lake City Airport. As for Salt Lake City itself, the city is home to a number of world-class dining, shopping, and entertainment options. Home to a zoo, an arboretum, and a number of public parks, there is plenty to do just a half-hour's drive from Garden Park at Daybreak. Salt Lake City is also home to the Energy Solutions Arena, where sports fans can catch a Utah Jazz game or music enthusiasts can see a concert. Thanks to the buzzing energy of the local area, Garden park at Daybreak makes the perfect home for active adults in Central Utah. Garden Club - 10,000 sq. ft. There are plenty of activities available in Garden Park at Daybreak. Here is a sample of some of the clubs, activities and classes offered here. The condos from Ivory Homes range in size from 696 to 1,791 square feet, and feature one to three bedrooms, one or two bathrooms, and an attached two-car garage. The townhome collection offers three floor plan options, ranging in size from 1,197 to 1,601 square feet. These attached plans offer one to two bedrooms, one-and-a-half to two-and-a-half bathrooms, and two-car attached garages. They also feature outdoor spaces like covered porches and patios, depending on the model. The slightly larger patio homes vary in size from 1,219 to 1,427 square feet, offering three different floor plan options. All plans feature two to three bedrooms, two to two-and-a-half bathrooms, and an attached two-car garage. Homeowners enjoy the outdoor space and walk-in closets these plans have to offer. The garden home collection also offers three distinct floor plans, from 1,433 to 1,517 square feet in size. Plans give homeowners the option to choose between one and two bedrooms, and all plans offer two bathrooms as well as a two-car attached garage. The estate homes are the largest in Garden Park at Daybreak, including five floor plans that range in size from 1,934 up to 3,328 square feet. Featuring two to four bedrooms, two to three baths, and an attached two-car garage, these homes offer a variety of customization options to fit any taste and budget. 55places.com is not affiliated with the developer(s) or homeowners association of Garden Park at Daybreak. The information you submit is distributed to a 55places.com Partner Agent, who is a licensed real estate agent. The information regarding Garden Park at Daybreak has not been verified or approved by the developer or homeowners association. Please verify all information prior to purchasing. 55places.com is not responsible for any errors regarding the information displayed on this website.